Two persons, including a schoolboy, drowned as incessant rains lashed Saurashtra and south Gujarat regions, with Gir Somnath being among the worst-affected districts in the state, officials said on Tuesday. According to the officials, 3,500 people have been shifted to safer places in different districts of the state. Chief Minister Vijay Rupani, who flew to Gir Somnath from Gandhinagar to hold a review meeting with district officials, was forced to return as the helicopter could not land at the Keshod air strip due to bad weather, an official said. He was later flown in a special Air Force helicopter. One Devendra Chavda (18) drowned in flood waters last night near Bhupgat town in Rajkot district, and efforts were on to trace his body, a Fire department official said. 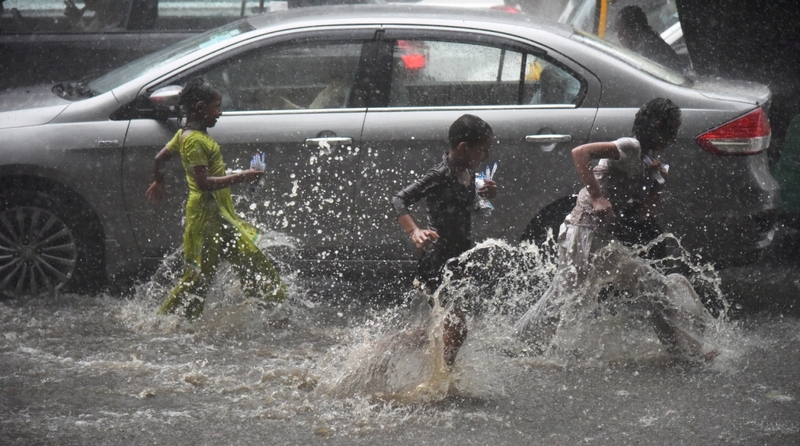 Sandeep Rathod (7) was washed by the rising waters of the Mini river when he was crossing it on his way back home from his school near Angadh village in Vadodara district, a Nandesari police station official said. “The incident took place yesterday, and his body was recovered today,” he said. Gir Somnath in Saurashtra has been the worst-hit district, along with Junagadh, Amreli, Jamnagar and Rajkot, while in south Gujarat, Valsad and Navsari district have been badly affected. Educational institutions in Rajkot, Gir Somnath and Amreli districts remained shut today, even as 20 teams of the National Disaster Response Force (NDRF) were pressed into service to carry out rescue and relief operations alongside local authorities wherever required. According to the officials, over 3,500 people across all the affected districts were relocated to safer places, and over 150 roads were closed as a precautionary measure. Several villages were being provided drinking water through tankers. A train running between Una-Delwada stuck near Una town in Gir Somnath district and passengers were rescued by the NDRF, an official of the Western Railway said, adding that some of the long-distance trains are running behind the schedule as heavy rains and waterlogging have hampered their movement. Many towns in Gir Somnath turned into islands as the district has been witnessing heavy rains for the third consecutive day. Over 27 dams and reservoirs in Saurashtra region are overflowing as districts like Rajkot (150 mm), Gir Somnath (300mm), Amreli (175 m) have been receiving incessant rainfall since the past 24 hours. South Gujarat region received 57.27 per cent of the average rainfall till today, even as 115 talukas in south Gujarat and Saurashtra received significant rainfall so far, a state data showed. North Gujarat, including Ahmedabad, has received the lowest rainfall in this season so far. Gir Gadhada taluka in Gir Somnath district received 496 mm rainfall overnight, followed by Una in the district at 350 mm and Kodinar at 330 mm. Dharampur in Valsad district received 225 mm while Valsad taluka received 217 mm rainfall. As per the official data, Junagadh and Jamnagar districts in Saurashtra received maximum rainfall since morning, with Manavadar in Junagadh receiving 251 mm rainfall in four hours since 8 am today.